July 23rd marked a new moon for us and I had been watching the weather for a week. The weather looked to be favorable so last minute I decided to hike out to some dark skies to photograph the Milky Way. My brother bailed on me, but I was fortunate to have a friend available and up for the last minute adventure (Thanks Crudo!). We arrived at the trailhead at about 9:30pm and began our trek up to the lake. We ran into a one pair of hikers who had turned around because they thought it was too wet to pass. I was initially disappointed, but decided to go on. There was one small section that took some fancy foot work, but it was smooth sailing from there on out. There is plenty of wooden bridges to help hikers through the wetter areas. I am glad we carried on, the view was well worth it! While in the forest, the skies were so dark it was disorientating. A few times we turned off our headlamps and everything disappeared. The stars at the lake were bright enough to illuminate the vegetation around us. There was some light pollution that reflected off the clouds at times. 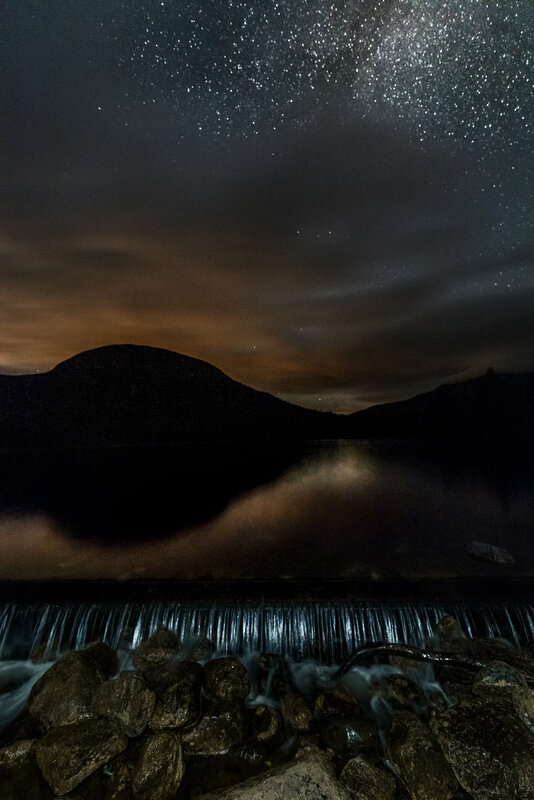 The last image I took was an experiment with some light painting of a small manmade dam on the lake.